Discount coupon codes for Speed Hound recovery boots can be found at the bottom of this review. It has been a few years since I did my initial review on Normatec vs Air Relax and along the way I had lots of questions regarding other compression boots offerings. While I never like to make buying decisions too complicated with choice, I did want to submit my recommendation on at least a third pair of recovery compression boots that is between the price points of Air Relax and Normatec and has a few nice features. That third offering is from a company called Speed Hound. Now Speed Hound is actually made by the same manufacturer that makes Rapid Reboot which is why the interface may look familiar to some. However, Speed Hound has got the price down to $650 which is $350 less than Rapid Reboot for frankly a form factor that I prefer to Rapid Reboot. I really dig the smaller size and sturdy retractable handle of this unit!!! In addition, they have compression hose cords sewn into the legs. This last point may not seem like a big deal, but the hoses on Rapid Reboot come out of the boots at the bottom and the long cables can quickly get tangled making entrance and exit more difficult. recover faster and feel fresher! 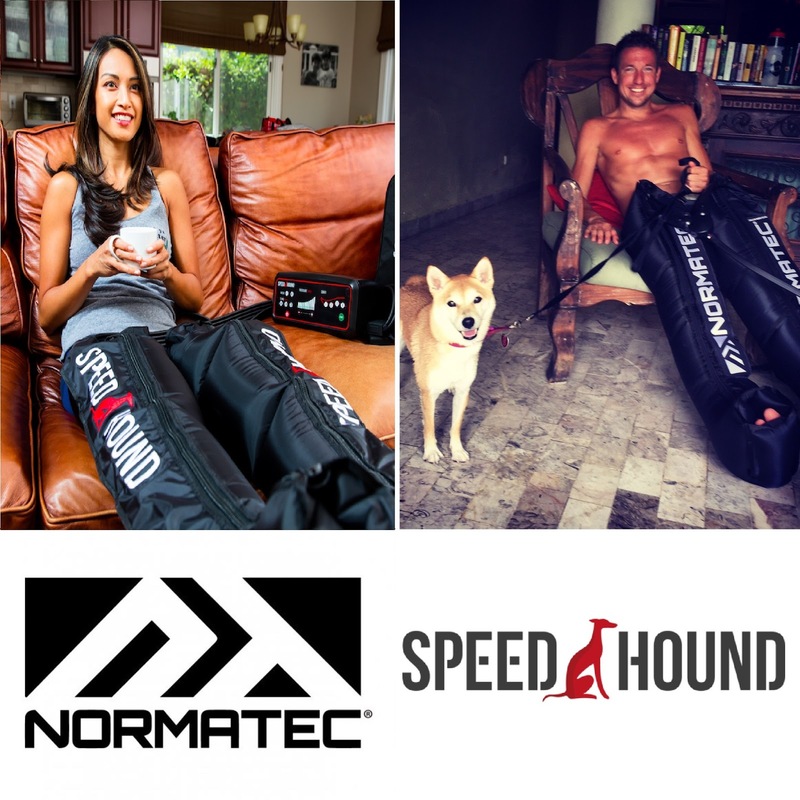 But this review isn't about Rapid Reboot vs Speed Hound, it is Speed Hound vs Normatec and the reason why is because I still consider Normatec the best known brand when it comes to compression boots. In short, Speed Hound does everything Normatec does with a high-quality offering at 50% the cost of Normatec. I am a huge fan of compression boots and specifically over many other modalities like e-stim (Compex & Marc Pro), percussive devices (HyperIce and TheraGun), and even foam rolling. The main reason why is that recovery compression boots are passive devices that don't require your attention. As athletes we are already busy and sometimes too tired to be bothered with anything additional and sitting in boots is so easy, so relaxing, and so fun. FWIW, I am typing this review while I am in boots. - Small, portable, compression unit. It is very sturdy with a sturdy handle that pops up out of the unit and collapses for storage. A little bit bigger than Normatec and weighs 8lbs 11oz for the system. - 3 easy select time cycles of 10, 20, and 30 minutes. You can of course do more than one cycle. - 10 easy select pressure levels ranging from 20-250mmHg. 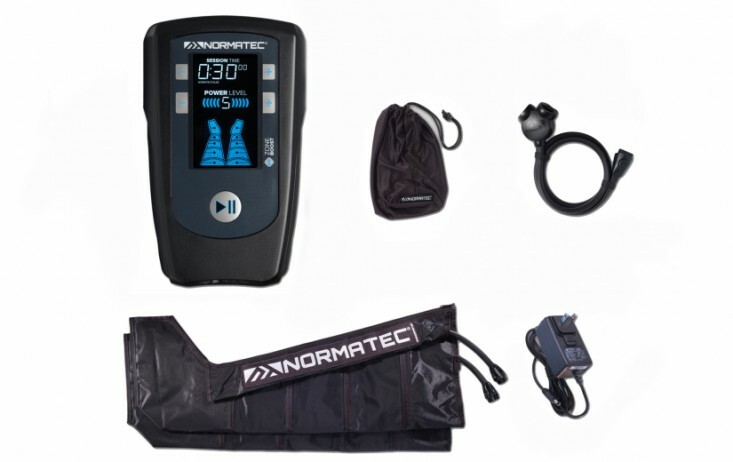 Normatec goes to 100mmHg over 7 levels. I really like the visual of the increasing pressure here for new users. - 4 programmable zones with the ability to shut off or turn on the exact zones you want. For instance if you just had a lower calf issue you could run just zone 1 and zone 2. - Features hidden hoses sewn in the legs with dark fabric that won't show dirt. - Comes with width extenders for those needing more width. Speed Hound boots are slimmer than Normatec. While compared to most triathletes, I have pretty stocky calves and thighs and I fit comfortably, but if you have really large calves/thighs it is something to consider. 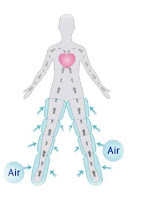 They do have wider models in the pipeline but if you are a lymphedema patient reading this I might suggest you take a look at my Air Relax review and consider those until they come out. - Carrying case is included so no need to buy an optional $150 carrying case. - 45 day "love them" guarantee with a 2-year warranty. - Optional attachments for hips and arms coming soon. Highly affordable direct from Speed Hound with an extra $50 discount when you enter discount coupon code RecoverFaster19 at checkout. They are NOT currently available Amazon as the company is doing it best to keep costs lows and selling direct helps keep those costs low. - Slim design that can be used and moved with one hand. Head unit is smaller than Soundhound. Total system weight is 8lbs 7oz for the system. - 1 mode of squeezing known in the industry as sequential compression, tweaked with Normatec's patented "pulse" technology with the zone boost option. - Time increment is controllable in 5-minute increments from 5 minutes to 2 hours. - 5 zones with no ability to program them off or on. - Optional attachments for hips and arms. - Optional travel case. $150 for a hard-shell case. - 2-year warranty for the Gen 2 Pulse. 1-year warranty for the 2015-2017 Gen 1 Pulse. - $1495 direct from Normatec or save $75 by using your Amazon Prime Visa (5% cash back) to purchase via Amazon Prime. I continue to believe strongly in recovery compression boots as a must own for any serious athlete and Speed Hound has developed an amazing alternative to Normatec at less than half the cost. With repeated use cycles and high pressures my number on concern is always durability and after 5 months of rigorous testing I know these are durable and you will love them and I really can't recommend them enough. The founders of Speed Hound are triathletes themselves and I love to support triathletes who are pushing cost boundaries and delivery great products. In addition, I have had a chance to see how much support and care Speed Hound has provided to customers already. I'm a big fan of customer service and I know Speed Hound will work with customers to make sure their customers are completely satisfied. On that last topic, although Normatec makes a really great product as well, I have been less than impressed with some changes and customer support recently. The company feels like it is losing its grassroots as it becomes too large and too corporate. Recently they moved their HQ as a sign of the expansion. While they continue to dominate on the marketing front supporting the biggest and baddest pro sports teams, I would prefer to see them focus on how the product can work for real world paying customer. I understand those high-visibility pro athletes are important, but they are never as important as a paying customer.